CINtactics is an ongoing series that decodes linguistic forms and tactics in cinema with a contemporary focus. Opting for B&W amidst the longstanding primacy of color is as foundational an artistic choice as one can make in cinema. Consider the communication of tone, mood, style and reference in films like Angel-A, Good Night And Good Luck, The Man Who Wasn’t There, The Artist, A Tout De Suite, Frances Ha, La Haine The White Ribbon and numerous others. Because this decision is so elemental to the expression of visual-narrative ideas, it is also broader in its scope and effect. The interplay between B&W and Color formats (something I term Chromatic Exchange) within the same film takes on a more complex linguistic attribute. This was brought to my attention at the 2016 Japan Cuts Film Festival where Japanese auteur Sion Sono received a loving spotlight for his most recent works. Sono’s oeuvre is among the tersest, most frenetic and most diverse in modern cinema. His works are singularly tapped into the psyche of his homeland, and cuts into the darker corners of that psyche with equal parts sprawl and specificity. His radical craft has spawned the likes of Suicide Club, Love Exposure, Noriko’s Dinner Table and Tokyo Tribe, each a visceral foray into difficult aspects of identity politics, and forces of cultural manipulation unique to Japan (though reflexive of elsewhere). But none of those works…each a little more insane, a little more transgressive, a little more groundbreaking than the previous….prepared me for the shattering modesty and reductive clarity of The Whispering Star. Filmed almost entirely in B&W from an updated script Sono first penned 20 years ago, The Whispering Star is a patient and cleanly methodical work that stands as a still point in the churning world of Sono. 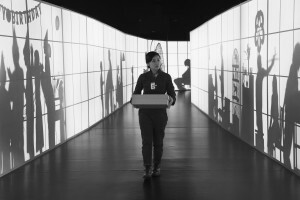 Humanoid deliverywoman Yoko Suzuki (Megumi Kagurazaka) brings packages to planets far and wide in the age of human near-extinction. In a time where teleportation is abundant, humans still prefer the personal touch. And yet Yoko, ostensibly a machine, is also compelled by the tactility of objects, drawn to nostalgia and the vintage, if only as concepts to be investigated. Even her ship, styled like a traditional Japanese home with booster rockets, replete with vintage bulbs, a leaky sink, tatami floors, three-prong outlets, and a child-voiced operating system that speaks out of a 1940’s speaker grille, are expression of her leanings. As does her recording of a travelogue on actual tape, and the fact that she is powered by AA Batteries. 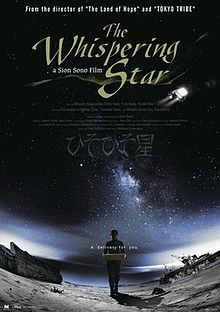 The Whispering Star is ultimately a film about memory: the ways in which we are beholden to the tape recorder of our minds, the ways in which we outsource objects to be vessels of emotion and markers of experiences, and the ways in which we experience time as simultaneously static, kinetic, psychological and physical. Perhaps Yoko hopes to learn why the anachronism of objects is so desirable to humans, and why receiving them can be so impactful. Is it because sentient beings exist across time? Biology is linear, but sentience is non-linear, therefore anachronism is the state of being. We accrue objects and in their assemblage anachronism is inevitable. The barren and unkempt worlds that Yoko visits are in fact the evacuated zones of Fukushima, bringing this meditation on the mystery of memory and objects into the fount of trauma and of healing from the 3/11 disasters. A town misshapen and abandoned can seem very much like an alien landscape. Shot in a warm and full range B&W, The Whispering Star contains a stirringly anomalous event. Yoko is delivering a package on a distant planet. The camera pushes gracefully toward a large open window from inside a dilapidated building and in doing so, it swells into full color to reveal a soft blue sky, clouds and a field overgrown with green and golden hues. Yoko walks through the lush landscape, the sharp blue of her uniform saturated to the fullest cuts through the grass as ocean waves crash on the obscured shoreline. The chamber music rises and halts as the shot cuts to a drab and dim interior. An instant of color (literally the second half of a single shot), reminds us of what the absence of color feels like. In that finiteness, color is an object gained and lost. This refined interplay between B&W and Color is but one example of its linguistic potential in film. One might recall the y oung girl in Schindler’s List standing out among the grayscale chaos of Nazi’s rounding up Jews from the Ghetto in her dusty red coat, such that our experience of this melee and tragedy is at once general and specific. Later we see her body, still shrouded in muted rouge, wheeled in a barrow to the massive bonfire of corpses and it cuts straight through to the heart. Color amongst B&W is used here with decisive impact to delineate a specific and personal course of events within a larger scope, and to contain a distilled sense of total loss. Chrispoher Nolan’s structural masterstroke Memento uses B&W and color more complexly to differentiate two narrative streams. The color scenes are arrayed in reverse chronology to emulate the experience of its protagonist, a man with short-term memory loss on a manhunt to find his wife’s killer. Intercut with this disorienting backtrack of seedy interactions are B&W scenes of him engaged in a phone conversation in a hotel room, as well as visualizations of the past (as he imagines they happened) moving linearly forward. Ever-constant is the tension between the emotional tug of a distorted past and the confused sprint toward the future, exacerbated by the oppositional chronologies and oscillation between B&W and Color. Perhaps the most elegant use of chromatic exchange is Gary Ross’s Pleasantville. A film with more depth and social acuity than mainstream audiences were prepared for at the time, a premise that sounds sillier than its execution, Pleasantville made a bold device of B&W and Color. High school siblings David and Jennifer tussle over the remote and get sucked into their TV. They are transplanted into the idyllic world of Pleasantville, a Leave it to Beaver style TV show that David was preparing to watch in marathon. As the two teenagers engage and integrate into their environment, from which there seems to be no escape, the ripple effects of their interactions, the ideas and questions they plant in the psyche of the townspeople with and without intention, stand as mirrors and wrecking balls to people who are seeing themselves suddenly for the first time. Objects in the town slowly take on actual color, the result of fundamental change and profound self-awareness. New emotions make waves in this monotone saccharine society and stir conflict where there was only blank pleasantry, breed jealousy and spur wonder where there was mere unquestioning complicity. People shift one-by-one from grayscale to technicolor, and along the way, our human proclivity toward prejudice and the virulence of puritanical morality rears itself. Rules are erected to stem the change and its challenge of the status quo. This is powerfully embodied in a shot during the film’s climax in which the very freedom to express is on trial. The “colored” citizens are relegated to the balcony, while the monochrome townspeople populate the courtroom floor. In a pointed and pictorial manner, racism (ostensibly between whites) helps to paint the absurdity (as well as suggest the inevitability) of the prejudicial reflex, and the fundamental fear of change. So too is shown the human proclivity to grasp at understanding, to seek and overtake boundaries, and to evolve in relation to one another. The color spreads piece by piece in a transcendent unstoppable display and radiates from the heart of so many personal narratives aching to be realized. In Pleasantville, color is elevated to a socio-existential phenomenon, which is a soaring example of the linguistic potential of Chromatic Exchange in cinema.